Thank you Leaf :) Hoping to add a new project to my library when work slows down a bit . I want to jump over to the latest GM as well for that. Thanks for putting A-mazing Ants on the homepage. Today was the most views I believe in a day this game has ever had which it awesome. Just wanted to say hi and say it would be very neat to go to a huge gathering of game developers . I have found since becoming part of the community of people that make games as a hobby that I always thought that I didn't fit in to the typical profile as a person who makes game. I work in the real world in a large industrial facility. I have found though that there are many out there who's career path is off in left field from the game development world. I started out kinda by accident as I was part of an online community of gamers playing the popular RTS Warlords Battlecry 3 and the developer made the source code available to the community to mod the game. I signed on and found I didn't fit in to the group that was there so I ended up working alone on a project without much help. For 6 years I worked on the MOD known as 1035 developing my own techniques to add the new content to the game both in code and art. I found that once again my creation was met with some fanfare both good and bad so I decided I wanted to try to make something myself. So I started work on what would be A-mazing Ants using good old Game Maker 8 at first before moving the game over to Game Maker Studio. I have always developed my own ideas and I do most of the art for my games. I really like Itchio and thank Leaf for making this site for people like me who will never likely be identified as a game developer but share the joy of creation and can have a home for their creations where like minded folks can find them. itch.io Community » General » General Discussion · Posted in #notatGDC — but will be there one day! Just finished playing "The Alpha Device" and really Visual Novels as you call them are becoming quite a nice trend on the indie game scene. There are a lot of small studios like yours here on Itchio and many of us develop using our own art due to budget and the love of creation process. Hello there yesterday I released Lost In The Boreal here on Itchio. The game is an outdoor survival game set in the 1800's in northern Canada in the heart of the boreal forest. You must try to stay alive as long as possible dealing with the ever changing weather. You have no gun to start with so hunting for food is pretty difficult. As the seasons change some of the berries that grow in the forest will provide some food. With just 48 matches you will have to try and conserve by keeping your fire going. The game was inspired by the fact that I live near the boreal forest and have always enjoyed the outdoors. I became a huge fan of The Long Dark and got the notion to build my own survival game. For those interested like all my games it was built using Game Maker Studio and all the art I done myself using Anim8tor software. I have the game listed for $2.00 this helps pay the cost of making the game and 10% goes back to Itchio so they can continue to host games. Most of the previous posts cover most of my personal strategies. I have a few unfinished games which I stopped working on because the concept wasn't as good as I thought once I got going. I usually mull over game concepts for a while before I start anything. Overall my strategy for finishing games is to keep in fun , take small breaks of a few days (play other games etc) so that you don't feel your game is like a job. Keep your game small at first and work specifically on each area until you feel you have a good foundation . I usually work on game mechanics before story (an example). I never bog myself down (since I do my own art) with one task so it never seems to get boring. I use a lot of randomness in my games as well. I also try to keep my game mechanics as simple as possible I don't try to build too much complexity as that is a project killer. And of course the last thought is once you have finished a game that game becomes a resource for your next project. 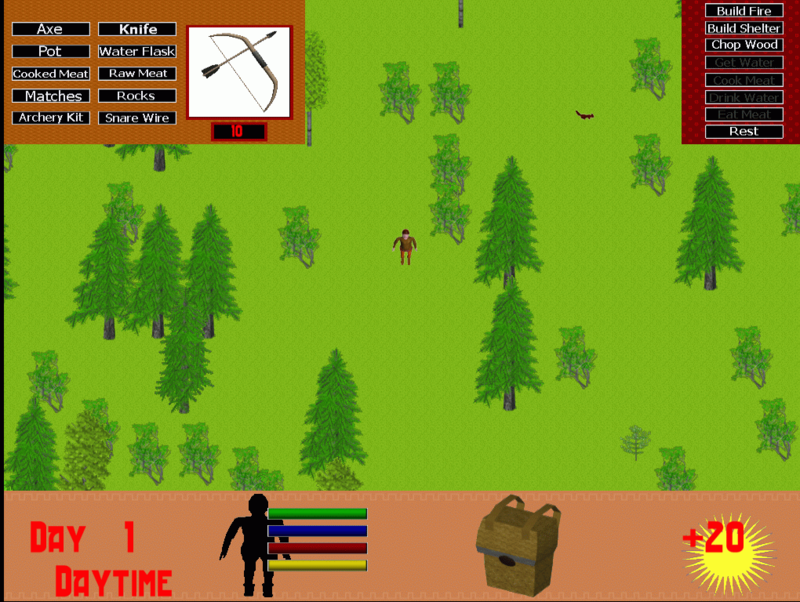 I am working on an outdoor survival game using Game Maker Studio. Working on the inventory lately and some game mechanics. Still alot of UI stuff to do yet. Hello I'm Andy from Alberta Canada . I'm being working on game projects now close to 7 years. I devoted the first 4 working on a pretty cool mod but I really wanted to make my own stuff so I started playing around with Game Maker Studio. I have some games on here they are pretty obscure for the most part . Ever wondered what it would be like to be taken by aliens to a far away planet where there is no beer? When I first started making games I thought that sharing information about the development of a project wasn't all that important but I have come to realize that it's essential for the process itself. You push yourself to get something done in time for screenshotsaturday and when you are finally done those folks that followed along with you help you in that initial release of your game / demo etc. Sharing makes the project more enjoyable so finishing it is more likely .